The most popular online recipe for flour tortillas calls for four cups of flour and two teaspoons of baking powder. 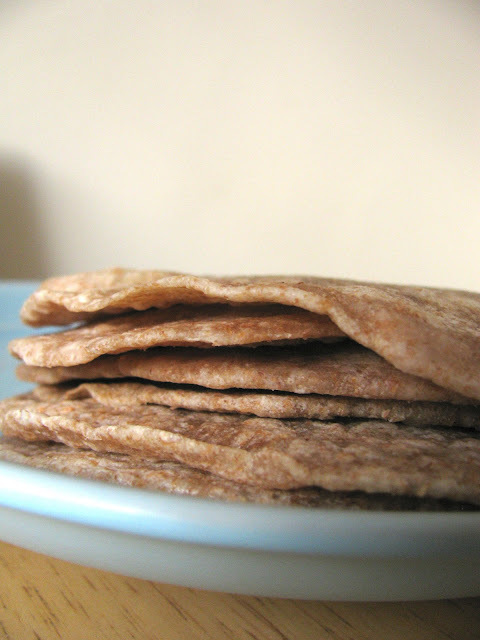 Years ago, when I started making my own tortillas (before I even got married), I tried this recipe. And what I ended up with was a number of rounds of big, puffy flatbread. Even when I rolled them out as hard as I could, the amount of baking powder in the recipe was so large that it caused the tortillas to puff up into something more like Indian naan than Mexican tortillas. Eventually, after some playing around with the proportions, I adapted that ubiquitous recipe in the flour tortilla recipe that I shared on this blog. My main change was to dramatically decrease the baking powder to just under 1/2 teaspoon. Still, if I let the tortillas sit too long they were apt to get too thick, and because of the baking powder in the recipe and the way it interacted with the dough I couldn't use my tortilla press to smash them—which meant that making flour tortillas was a time-consuming and laborious process involving liberal use of the rolling pin. And, as much as I loved my tortillas, they weren't like the ones I'd had at Cafe Rio. There was something different about them that I couldn't put my finger on. Earlier this year, when I was in North Carolina, I went to a Relief Society activity where a dear friend gave a demonstration on making fresh tortillas. When I tasted hers, I realized that they were much more texturally similar to the Cafe Rio tortillas I remembered eating. And she made hers using a tortilla press! Once I saw her recipe, I realized the difference—there was no baking powder at all! Now, at least once a week we make flour tortillas using this new-and-improved recipe. And yes, friends, this is VERY similar to what they use at Cafe Rio. So don't believe that one going around on Pinterest! THIS is the recipe you want. Heat pan or griddle to 325-ish (do not grease). In a large bowl, combine flour and salt. Stir in canola oil. Add water gradually (I usually start with 1 cup, mix, and then add the water about 1/4 cup at a time after that) until dough is moist and holds together without being sticky. Knead with hands for a minute, then divide into balls about the size of a ping-pong ball or smaller. (Your dough balls can be bigger if you are rolling out by hand and not using a tortilla press.) In a tortilla press lined with a sliced-open plastic bag (to prevent sticking), press balls twice (I usually press, pick up the tortilla, flip it over, and press again). Cook tortillas 3-5 minutes on each side. Fill with your favorite taco or fajita fillings. 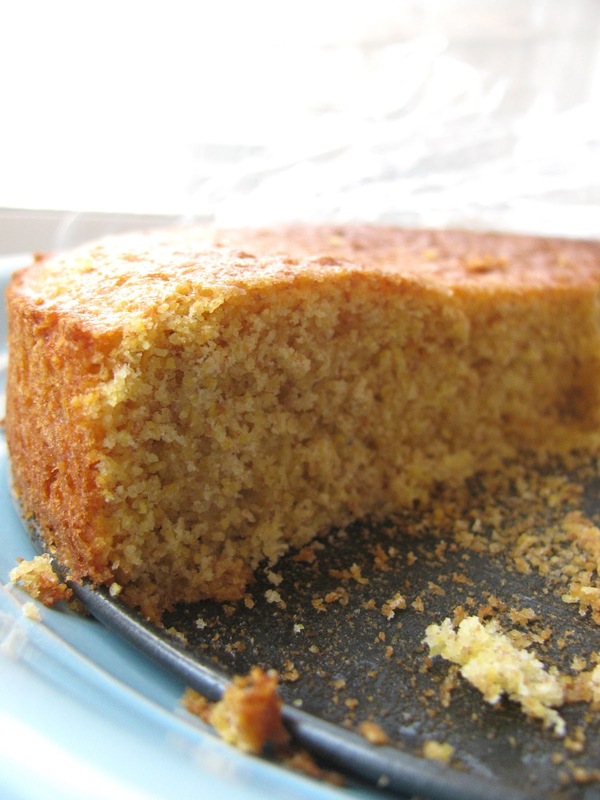 I adapted my favorite cornbread recipe so that it is 100% whole grain (cornmeal and wheat flour) and sweetened with honey instead of white sugar. We love to eat this cornbread with whipped honey butter. Heat oven to 400º F. Grease 8 or 9 inch square or round pan (I like to use my smallest springform pan; muffin cups can also be used). In large bowl, combine all ingredients and mix well. Pour batter into greased pan. Bake for 20-25 min or until toothpick inserted comes out clean. For muffins, bake 15-20 minutes. 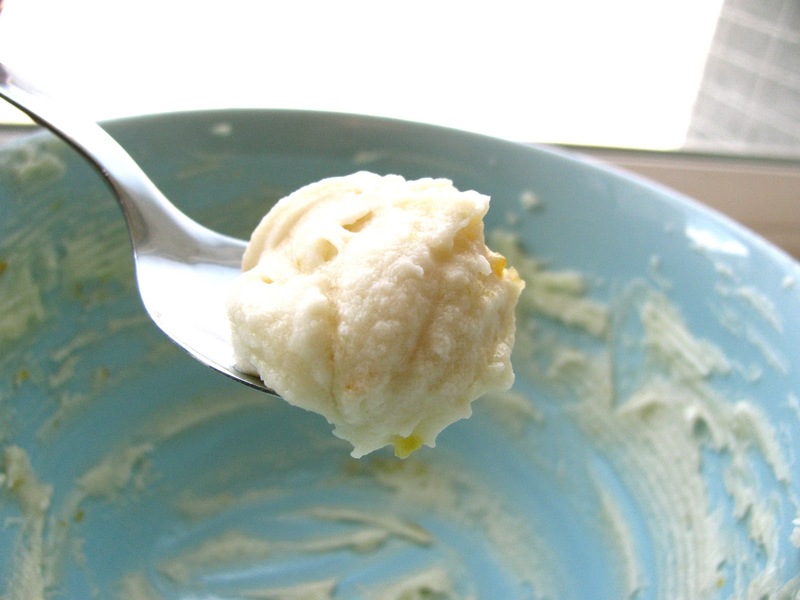 Growing up, my family often made honey butter by mixing the two together. The result was delicious, but more like honey than butter. When I went to college I discovered whipped honey butter in a local restaurant—a product that tasted like honey, but had the creamy, light, melt-in-your-mouth texture of whipped butter. I though I had died and gone to heaven! A few years ago, Mahon and I decided to try to make our own whipped honey butter. All the recipes I found online had powdered sugar, and since we were going for a healthy product and not something that was artificially sweetened, we didn't want to add that. So we played around on our own, and perfected this sweet treat! It is delicious on bread, scones, cornbread, or just about anything else you can think of. The basic recipe—butter, honey, and a dash of vanilla—is divine, but you can also add in other flavorings. We recently did cinnamon honey butter and orange zest honey butter, and they were both amazing! In a bowl big enough to accomodate a hand mixer, add all ingredients together. (If using hard raw honey, don't melt it, but do be sure to use softened butter.) With a hand mixer on medium speed, blend ingredients for a few minutes until they are light and hold their shape (like soft whipped cream). If the honey butter is too runny, add a little more (room temperature) butter; if the flavor is too buttery and not strong enough, add honey a little bit at a time until desired flavor is reached. Stores well for a day or two, covered at room temperature, or for about a week in the fridge. If refrigerating, let it soften at room temperature for at least half an hour before using. If you know me much at all, you probably have figured out that one of my passions is healthy eating. One of the biggest roadblocks a lot of people seem to run into when it comes to eating healthy is vegetables—America's least favorite food group! In all honesty, I've always LOVED most veggies (thanks, Mom and Dad!) and veggies comprise some of the favorite foods in the Baldwin household. What I've learned about making good veggies, though, is that it really matters how they were cooked. I want to start highlighting some of our favorite side dishes and the way that we prepare them here. Hopefully you will love them as much as we do! One side dish we have a few times a month is "butter" beans (baby lima beans). My mom's grandpa had a farm in South Carolina, and I LOVED when we would have fresh lima beans from his garden with plenty of butter. A year or two ago, I started buying frozen baby lima beans at the store and playing around with cooking them until I hit on something that tasted as good as my memories. 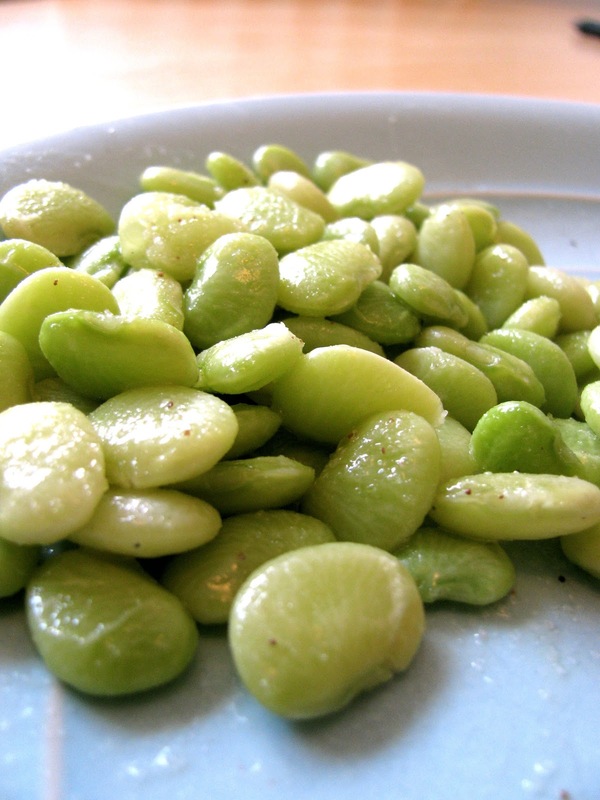 Most people will say they don't like lima beans, and I think it's because the way a lot of people prepare them, they are very dry and tasteless. These, on the other hand, are rich, creamy, buttery, and delicious! Because lima beans are legumes, they are very high in both protein and fiber (as well as other beneficial nutrients). I usually serve lima beans if we are having a meal that doesn't have meat in it, like a meatless pasta dish or baked potatoes. The protein in the limas makes for a very filling, satisfying meal, and the combination of protein, fiber, and slow-acting carbs in the beans help stabilize your bloodsugar as well. Pour lima beans into a small saucepan and add water until the water covers the beans by about 1/2 an inch. Add a generous shake of salt and pepper. Heat on medium high just until the water starts boiling, then turn to medium-low and put a lid on the pot. Let cook for 20-30 minutes (check it periodically to make sure the water has not boiled away), or until lima beans are soft and their skins are just starting to split. Turn off the stove, strain beans in a colander and then return them to the hot pot. Add butter and stir the beans until butter has melted. Serve immediately, with extra salt if desired. *If you're worried about using butter in this dish, I highly recommend reading this article. It may surprise you, but butter eaten in moderation is actually really good for you!